Please join us for an evening of Self-Care and Self-Love to deeply nourish your being. Love is the very essence of what we are and connects us all as One. In this event we will invite this radiant force within us to flow freely and brightly infusing our lives with its Divine brilliance as we set the intention to release the resistance within that holds us back from shining our brightest. This practice will begin with a Yin Yoga class, settling into poses for 2-5 minutes at a time (with props as needed) to access the deep connective tissues of the body and to release deeply held tensions. This practice is helpful in supporting the well-being of the fascia, bones and joints, as well as supporting the overall flow of vital energy/life force throughout the body and bringing ease and space to the active mind. This is a great preparation for the more subtle practices that follow. Next, we will work with the breath, engaging in pranayama exercises (breath exercises) to support and balance the pranic body (energy body) and create a receptive state for the deeply restorative practice of Yoga Nidra. Then we will make a comfortable nest on our mats where we will lay in Savasana (corpse pose) for about 45-60 minutes of guided relaxation. 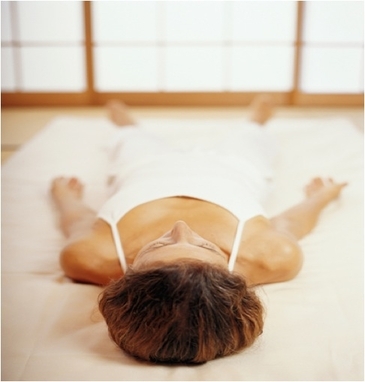 Yoga Nidra is sleep with trace awareness or deep conscious relaxation. It is a state of mind between wakefulness and dreaming where contact with the subconscious and unconscious dimensions of the mind occurs spontaneously. This is a subtle, yet powerful experience in which you learn to relax consciously, systematically inducing complete physical, mental, and emotional relaxation. When you practice Yoga Nidra you are opening to the deeper levels of your mind while remaining awake and aware. The benefits of this practice can be many, as there are so many states of dis-ease in our lives today that are a result of tension at some level of our being. The practice of Yoga Nidra is the scientific method of removing these tensions and re-establishing ease. It is recommended to bring an extra blanket, pillow, eye pillow or scarf, and that you have layers of clothing to remain very comfortable during this practice. The more comfortable the body can become, the deeper we can settle into the realm of consciousness. Please join us for this nourishing practice to help support your overall well-being. Registration Deadline by March 13, 2019. Payment in full is required to hold your space in the event. If there are not enough participants signed up to run the event, the full payment will be returned. However, if you sign up for the event and fail to show up, the payment will not be returned.